Showing 1 - 15 of 27 articles tagged "Judd Apatow"
The Pete Holmes semi-autobiographical comedy's Season 3 finale on Sunday will serve as a series finale. Was Louis CK's "woke" brand a ruse all along? The ABC reality show paid homage to Steve Carell's iconic movie poster with its newest promo. "Bryan Cranston auditioned," Apatow said in commemorating the 10th-anniversary of the Seth Rogen-James Franco film. Here are some suggestions for handling a post-Roseanne Barr Roseanne spinoff, including: "Season 10 was Dan’s Ambien-infused dream. Fox News shows like Fox & Friends have defended President Trump's family separation policy. "Aw man, I'm so sorry to hear this," tweeted Night Court co-star Marsha Warfield. 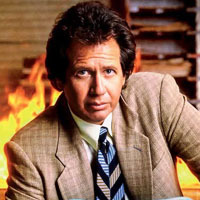 "Friends who love Garry, working with his estate, are opening up Garry’s twitter," Shandling's account tweeted today. Did Judd Apatow's Garry Shandling documentary need to be four-and-a-half hours long? The Zen Diaries of Garry Shandling is Apatow's "best, most focused" work since Freaks and Geeks, says Matt Zoller Seitz.